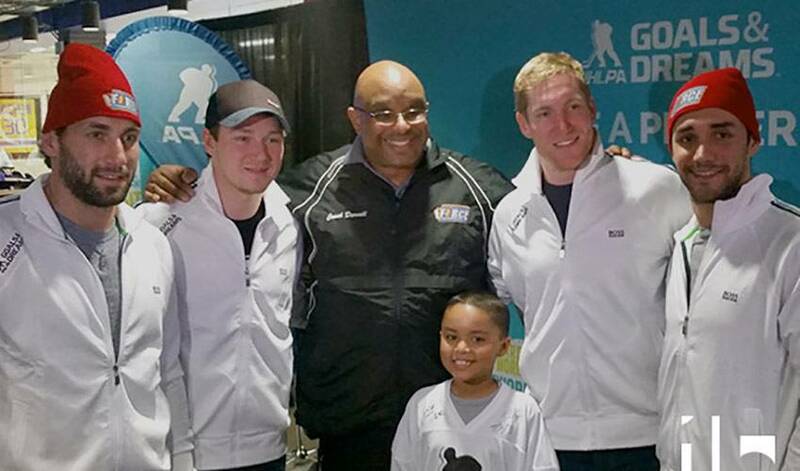 On Thursday, January 29th, the NHLPA Goals & Dreams fund continued its multi-city tour, celebrating 15 years of giving back to grassroots hockey. On Thursday, January 29th, the NHLPA Goals & Dreams fund continued its multi-city tour, celebrating 15 years of giving back to grassroots hockey. Following stops in Hastings, MN, Ottawa, ON, Vancouver, BC and Toronto, ON, the tour touched down in Los Angeles, CA with members of the home town Kings on-hand. After watching the local Kings practice at the Toyota Sports Center in El Segundo, children from the Hawthorne Force Youth Ice Hockey Program were joined after lunch by NHLPA members Kyle Clifford, Matt Greene, Alec Martinez, Jarret Stoll and Tyler Toffoli. As part of the celebration, the NHLPA Goals & Dreams fund donated 25 complete sets of new hockey equipment to the Hawthorne Power Project, an all-girls program under the umbrella of the Hawthorne Force Program. The equipment, valued at $12,500, will help expand the club and allow more girls the chance to play hockey, an opportunity they otherwise would have been unable to receive. Members of the Hawthorne Power Project and Force programs were thrilled to meet some of their heroes, with many getting the chance to ask the NHL players questions about life in the pros, what it took to get there, and where they started out. Following a visit with the Kings, which naturally included smiles and laughs over photos and autographs, the young athletes took to the ice to test out their gear. Former member of the US women's national hockey team and current NHLPA associate counsel Maria Dennis led the girls of the Power Project in a skills session, with this being one of the first times skating for many of them. At the same time, a mini game was held among the rest of the Force program, with tips and water breaks provided by the Kings players on hand. NHLPA special assistant to the executive director Mathieu Schneider, also in attendance for the event, spoke about the impact of the Hawthorne program and why it is such a great fit to partner with the NHLPA Goals & Dreams fund. Upon taking to the ice, it was immediately evident that the Hawthorne program participants were very proud to share the same ice that their favourite Kings players skate on. Jim Connor, Program Director and Head Coach as well as a 22-year member of the Hawthorne Police Department, voiced his enthusiasm for the donation and involvement from the NHLPA members, going back two years to the fund’s initial donation to Hawthorne. As Connor spoke of the values of the Hawthorne program, it was perhaps fitting that the Kings players were standing under a giant photo of their Stanley Cup championship team from last season – one of the greatest testaments to a team coming together to accomplish the ultimate goal. “Our players are taught to encourage and compliment each other, and that the name on the back of the jersey is not as important as the one on the front. Teamwork gets the job done,” said Connor, as the children were joined on-ice by the Kings players for a team photo that, much like last season’s championship squad, will never be forgotten. Fans interested in supporting the Hawthorne program as well as collecting one-of-a-kind game-worn memorabilia can now bid on jerseys worn by Kings greats - past and present - including from Jonathan Quick at the 2014 Winter Olympics. Proceeds will be donated directly back to the Hawthorne Force Youth Ice Hockey Program. The auction will run until Wednesday, February 11th.